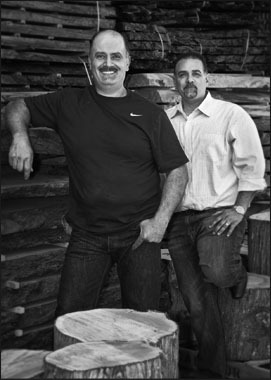 Menlo Hardwoods is a collaboration of two Bay Area natives and childhood friends. Mike Balat, with 25 years of custom cabinet and millwork manufacturing, is the lead craftsman behind all the furniture being produced. George Bazlamit, with 20 plus years in the design and construction field, has the expertise to help guide you through design and production of your very own custom, quality piece of furniture. Menlo Hardwoods is a premier manufacturer and retailer of custom one-of-a-kind, live edge and contemporary solid wood furniture. We build all of our hand crafted pieces right here in California. Our new showroom, located in Menlo Park, is our first venture into a retail location where we will showcase many of our custom solid wood tables, accessories and other pieces of unique works. We welcome you to come and explore the beauty and timelessness of having a quality solid wood piece of furniture in your home or office.